In addition to the Amazon DynamoDB web service, AWS provides a downloadable version of DynamoDB that can be run locally. This edition of DynamoDB lets you write applications without accessing the actual Amazon DynamoDB web service. Instead, the database is self-contained on your computer. This local version of DynamoDB can help you save on provisional throughput, data storage, and data transfer fees. In addition, you do not need to have an Internet connection while your are developing your application. Assuming that have downloaded from https://aws.amazon.com/blogs/aws/dynamodb-local-for-desktop-development/ and are running the database locally with the command java -Djava.library.path=./DynamoDBLocal_lib -jar DynamoDBLocal.jar -sharedDb , you can access the database from a browser at http://localhost:8000/shell/ . Make sure you're able to access your DynamoDB, and have created tables and data before you proceed. For a local instance, you don't need to fill in information in the Authentication tab. All you need is to give a name to the connection (e.g. 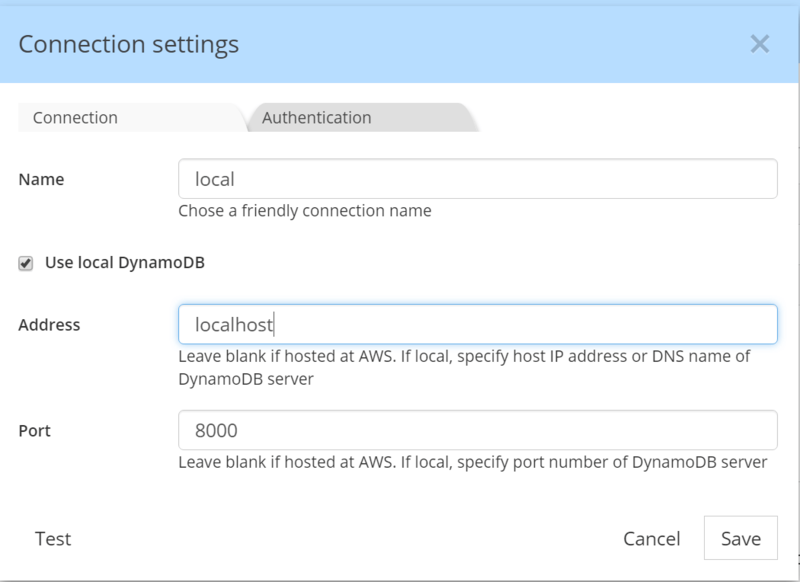 ; 'local') and check the option 'use local DynamoDB'. If you local instance is installed on your computer and using port 8000, you should not modify the suggested parameters.